From Iran. Lives in Sunset Park, Brooklyn. 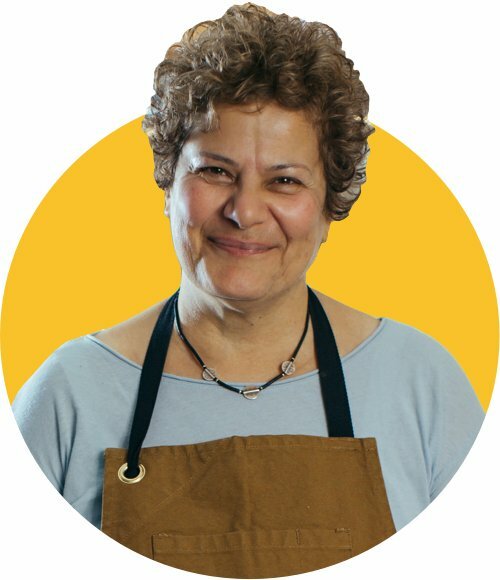 Mab is a women’s rights activist, documentary filmmaker, and educator who believes food provides a special opportunity for connection and empowerment. Mab was born in Khorramshahr, a city with a large Arab population in southern Iran, but her parents have roots in the Azeri region of northern Iran, an area whose cuisine Mab knows well. She learned about ingredients from her dad, who owned a restaurant, grocery store, and tea importing company, and about the importance of cooking “low and slow” from her mom. Mab’s mother, who was often homesick for the northern region where she grew up, also taught her daughter that cooking is the best way to bring back the flavors and smells of home. As a young woman in the late 1970s, Mab became involved in the Iranian Revolution, but later, when she became a vocal advocate for women’s rights in Iran, she was persecuted by the Islamic Republic. After being imprisoned three times during the 2000s for organizing peaceful protests, she fled Iran and moved to New York City. Before joining the League of Kitchens, Mab managed the nonprofit organization Zanan TV, and she continues to work as an educator in schools around New York City. She feels that food, like activism and education, is an important way to express herself and to connect with and understand others.